The good news: The pub’s owners have already found a new home for the tiny, 92-year-old bait-shop-turned-watering-hole, practically right across the street. Later this year, they hope to move the Kingfish — to literally pick the whole building up and set it down again at the new site. If all goes according to plan, the new Kingfish will be the same as the old — the same green paint job, shack-like exterior, oversized Seven-Up sign, and happy customers. 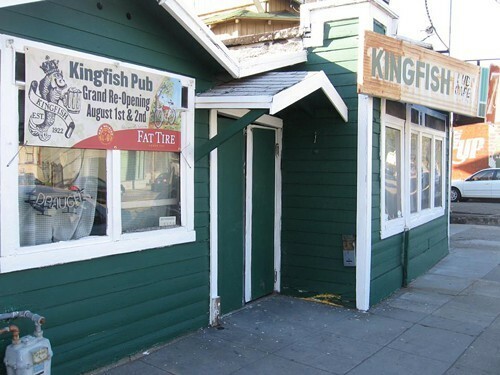 Talk of demolishing the Kingfish in order to make way for condos has been going on for years, but the project was initially waylaid due to the down economy. But the owners of the property have now sold it to developers who are moving forward with the condo project, and they’ve given the pub their ten-month notice. Owners Mike Bowler and Emil Peinert, two longtime bar patrons who took over the Kingfish’s lease in 2009, saving the pub from being lost to history a first time, now hope the proposed move will save it again. They’ve agreed on terms to purchase an unused building at 5239 Telegraph Avenue, a former Ethiopian restaurant located next door to the Tool Lending Library. The plan, Bowler said, is to tear the restaurant down, leaving behind just enough space for the Kingfish. There should even be enough room in the lot for the bar to add a small outdoor patio in back. The pub’s ten-month grace period ends on January 1, 2015, but Bowler and Peinert said they hope to complete the move sometime in the fall. In the meantime, the Kingfish will remain open at its current spot. All of this is pending city approval, of course. As daunting as the idea of picking up an entire building and moving it sounds, Peinert said that will be the easy part. He and Bowler plan to simply hire a house-moving company — and the Kingfish is small enough, and the move will be for short enough a distance, that Peinert doesn’t expect any problems. “The red tape is probably actually more challenging than the physical process,” he said. That said, because of the Kingfish’s designation as a historical building, Peinert expects that he and Bowler will only be required make minimal upgrades before they reopen the pub. They’ll add an ADA-compliant bathroom and make a few safety improvements, but otherwise the building itself should remain largely unchanged. For regulars, many of whom have been frequenting the Kingfish for decades, that can only be a good thing. “We’re planning on keeping the shack looking like the shack it is,” Bowler said.